Every experienced bow-hunter is aware of the importance of using the best crossbow scope possible. Owning the highest performance crossbow and having exceptional shooting skills is just some pieces of the puzzle. In order to reach your full potential and be an accomplished shooter, you need every help you can get. A crappy scope would jeopardise your efforts, so you need to make sure that you spare some bucks for a better one that will enhance your aiming. Despite the fact that most crossbow packages come with built in scopes, more often than not they are lacking in quality and a third party option can make a significant difference to your hunting experience. But, how will our crossbow scope reviews help you? Having tried and reviewed a lot of scopes ourselves, we want to share our “wisdom” with you, our fellow hunters, and provide you with the right scope for both those looking for the highest quality and those who are on a budget. This is a great alternative if you care about the quality of the optical components in your scope. The HCA-09811 boasts fully multi-coated 1.5 to 5x optics, which means that the loss of light transmission is significantly reduced. On top of everything, the 30mm tube is capable of improving light gathering, so in a nutshell, the images you’ll look at are going to be crystal clear. The variable optics that this model comes with make it possible for you to benefit from excellent versatility. The reticle is illuminated, but there’s nothing stopping you from getting in touch with the manufacturing brand and getting a non-illuminated one if that’s what you need. The markers range from 20 to 60 yards and this particular scope is calibrated for bolts that fly between 275 and 425 FPS. It’s very hard to go wrong with this option seeing how TenPoint also manufactures crossbows, so the engineers actually know what they are doing so as to make the products compatible with your weapon of choice. With older versions, there used to be a red ring around the lens, which made it easy for the prey to spot the hunters. Fortunately, this has been removed. Probably the best thing about this scope is the fact that it comes with variable zoom, allowing you to select the right one between 2.5x and 6x. It is adjustable for crossbows shooting at speeds ranging from 275 to 410 FPS. What that means for the end user is that he or she will be able to use it with several types of modern crossbows. 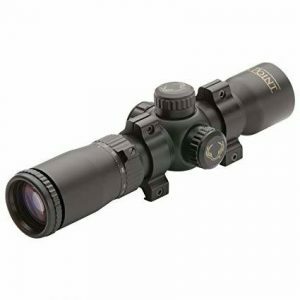 Since it measures just about thirteen inches in length and it weighs in at less than one pound, this scope can be considered rather compact. There are no rings included in the purchase, though, so you have to get them separately. The quality and brightness of the images you will look at are going to be top-notch since the Excalibur alternative comes with fully multi-coated optics, something you might not encounter in cheaper versions. As for the field of view, it’s approximately 45 feet at a 2.5x magnification, but it decreases to around 20 feet at a 6x magnification. That should be sufficient for you to shoot at any target. If what you are in the market for is a versatile, yet reasonably compact scope for your crossbow hunting, perhaps you should check out this model. For one, it is uniquely small since it measures just 8.5 inches in length. That makes it a great alternative for crossbows. The unit boasts fully multi-coated 3×32 optics, so that’s one less thing to worry about. Again, what this means for you is that you are going to benefit from great light transmission thanks to the high quality of the lenses. There are three different reticle options you can choose from and they consist of black, illuminated red, and illuminated green dots. This product is calibrated at 20, 30, 40, as well as 50 yards. Something that definitely sets it aside from the plethora of competitors it has is the fact that it comes with the rings included. Therefore, what you see is what you get and there won’t be any additional expenses related to this item once you purchase it. Compared to some of the other products mentioned here, this one is a little larger, although still reasonably compact for you to use it conveniently and comfortably and even uninstall and install it as swiftly as possible. The Dead-Zone is a variable multi-reticle scope, so you have the advantage of a lot of versatility coming from that. It has been designed specifically to fit all the crossbows that can shoot within the range of 300 to 410 FPS. The product comes with a 32mm objective lens, and it also includes a one-inch tube so that the light transmission is not impeded. It’s also worth noting that the optical components of this particular model are fully coated, so that’s what explains the overall lower cost compared to that of similar choices. While some prospective buyers might consider this detail a disadvantage, it’s just a trade-off so that the scope can be cheaper and as such, available even to hunters on a budget. The size of this scope is an advantage in itself as it measures just 8.19 inches in length and weighs in at around 12.3 ounces. With this weight, you can use it anywhere. The objective lens that it comes equipped with is a 32mm piece of glass, so you don’t have to worry about anything ruining your user experience. The product offers a fixed magnification of 4x, so it is somewhat less versatile compared to the variable ones we’ve also showcased here. The clarity and the resolution are excellent, however, and many hunters have expressed their satisfaction with regard to the value it offers for the money. Some of those that have tested it say that it seems that the lenses are fully multi-coated, even though the manufacturer hasn’t provided any information in this sense. Several hunters have noted that having all five lines crossing the diameter of the eyepiece can be an inconvenience and that they would have appreciated a pyramid-style reticle a lot more. One of the notable benefits you will be getting if you decide to opt for this alternative is its fully multi-coated optical system, which ensures excellent light transmission, making it easy for you to look at images that are bright and clear. Also, if you’re having trouble selecting a good spotting scope for your crossbow, you might want to know that this one is designed for a variety of point weights, as well as an array of velocities. The reticle’s 20-yard ‘zero’ makes it possible for you to aim at your target and shoot with confidence. Furthermore, you can perform reticle adjustments conveniently and comfortably since this optical instrument is outfitted with a click-stop. The turret caps are made out of aluminum, which means that they are capable of standing the test of time. But that’s not all, since the whole item is made of aircraft grade aluminum, which means that you get a lightweight, yet fully rugged tool for your hunting pursuits. The Excalibur Twilight DLX Crossbow Scope is made for the serious Excalibur crossbow hunter. It is designed to pull in the maximum amount of light in those especially low light situations to give you the best possible chance of success. So in those situations when you have the best chances of bagging the big ones, usually before sunrise and after sunset, you will be able to make the most precise shot and bring your quarry home. The Excalibur Twilight DLX can do this because it has a huge 44mm objective lens that gathers the most light possible, a 30mm tube for unimpeded light transmission, and fully multi-coated fogproof lenses throughout to maximize brightness and clarity. It also has the Multiplex crosshair system for accurate placement in 10 yard increments at any speed between 300 and 400 fps, and Excalibur’s dual red or green color illuminated reticle that really helps in these low light situations to improve your accuracy. The speed shooters will love this scope. Its fps adjustment starts from 270fps and maxes out at 425 fps making it suitable for even the fastest rigs. This scope is great out to 100 yards and very easy to sight in. We strongly recommend the Hawke scope to everyone owning or about to purchase a crossbow. It is probably the best crossbow scope on the market in 2019 and a huge upgrade for almost every single crossbow package. This scope’s quality is far greater than what its price may suggest. While not perfect for extremely low-light conditions it is usable at late afternoon or early on the morning and for such a low price you also get a waterproof and fogproof scope with good clarity, brightness and contrast. For those on a budget we feel that the Truglo 4X32 Camo is the best crossbow scope for the money. Sure there are better options out there when it comes to performance and quality, but they cost twice as much. This lightweight scope will help improve the accuracy of your shots, and it is designed to be easy to mount on your crossbow. Weighing only 9.8 oz. it won’t throw off the balance of the crossbow, and with a wide field of view even at 100 yards you will be able to see any game that wanders across your path. The MAP from Hawke comes with optics that are fully coated so every image is sharp and clear, and the lens also lets in plenty of light. It has an innovative bell shaped design that will help prevent eye fatigue and strain, and this also makes it easier for you to quickly focus in on potential targets. With the ability to aim from 20 yards up to 60 yards, this crossbow scope might be just what you need on your next hunting trip. When you are ready to add a scope to your crossbow there are a few aspects to consider, and the following tips will help you narrow down your choices so you can make a smart buying decision. Crossbow scopes can vary in size, and you want to choose one that is smaller enough to easily carry with the rest of your gear. The scope should also weigh less than one pound so it does not throw off the balance of the bow. Heavier scopes can not only make the bow difficult to hold, it can also make it almost impossible to aim your shots accurately. Most experts recommend choosing a scope with a wide lens so you can easily see any targets, but still comes in a lightweight and compact design. While magnification is important since you want the scope to be powerful enough to clearly see images at a distance, you also want to consider the quality of the optic lens. Even the most powerful scope will be useless if the lens isn’t capable of producing crisp and bright images. Crossbow scopes with fully multi-coated lenses are designed to allow plenty of light to flow through so you will be able to clearly see your target regardless of the distance. You also want to make sure that the scope is nitrogen filled since this will prevent early morning dew and fog from clouding the lens. If you are not able to use the scope anytime you need to it can quickly become a waste of money. This is why it is worth it to take a few extra minutes to ensure the scope is moisture and fogproof. Being able to compensate for range is always an advantage, and most scopes come with a reticle. These convenient markers can make it easier for you to make an accurate shot regardless of the distance or elevation. The field of view is also important, especially if you don’t want to miss seeing a potential target. Wider lenses will give you an improved field of view, but it is important to remember to consider the overall weight of the scope. Some hunters only worry about this when they are hunting deer, but it can also improve your chances of hitting varmints and small game. Most crossbow scopes are designed to be easy to mount, but it is still something that you want to consider. You also want it to be easy to calibrate or adjust so you can concentrate on the target and not on the scope. Scopes that allow you to calibrate for elevation and wind speed without the use of a tool are generally preferred over other models. These crossbow scopes typically come with small dials that make adjustments a breeze. As the dials are turned you will hear an audible “click” which is designed to help you keep track of the adjustments. While accuracy and ease of use are important, you also want the scope to be designed to last. Crossbows and scopes can take a lot of abuse in the field, which is why you want to make sure that it comes with a durable construction. The mounting rings should be firmly attached and resistant to everyday wear and tear, and you want the casing to be able to protect the scope against occasional drops and being banged around with the rest of your gear. For added protection and durability some crossbow scopes also come with a sturdy storage case, which is also convenient when you are traveling. When purchasing a crossbow scope, there are several main factors you should consider. There are a lot of major and minor considerations when buying this equipment. First, we will take a look at the major items to consider. Obviously, look at your budget and how much you can take from your savings accounts. Some scopes can be bought for less than $70, while some run well over $150. You want to be sure that you spend as much as you can, without breaking your budget. Second, you want to look at the size of the lens that you want for your scope. The larger the lens, the higher level of power you will get. They also translate to larger viewing areas. Next, look at the power and settings of the scope. You want to be able to use your scope and quickly adjust it easily. The more intuitive your adjustment options are, the better and faster you will be able to acquire your target. There are tons of options available, so when you pick your scope, make sure you choose one that helps you aim, acquire your target, and can stand the test of time. The best crossbow scopes are light and rugged, with great lenses and optical quality. The image quality is absolutely vital, as this is the reason you are buying the scope. The more light that enters the eyepiece, the shaper your resolution will be and more accurate your shot will be. Lens coatings reduce reflection, which causes glare. You should buy a lens that has at least a single coating on it. Furthermore, check to make sure your scope is fogproof and waterproof. This will save you headaches and repair costs in the future, not to mention the higher quality shots you’ll make. Finally, make sure that the scope warranty gives you solid coverage. Manufacturers often give lifetime warranties on their products. There is a lot of competition out there, so this is a major consideration as well. If a company is willing to replace your product if it fails, then that can save you hundreds of dollars right there. The bottom line here is to use common sense. As long as you stick with the brands with good reputations, you will probably be happy with your new scope and the shooting experience it gives you. What will I use my scope for? Competition shooting, General target shooting, Hunting, or some combination of the 3. What is the intended range of my targets? 20 yards, 20 – 60 yards, or over 60 yards. What are my preferences for Magnification, Reticle Type, Field of View, and other technical adjustments? Magnification is one of the basic scope characteristics. It measures how many times better you can see an object than with your naked eye. Some rifle scopes offer a range of magnification, for instance anywhere from 3x to 9x. Field of View is the actual width of your scope’s sight picture at a specific distance. For example, at a range of 200 yards, a scope can give you a sight picture that is 20 feet wide. Field-of-view is a function of both magnification and the focal lengths of the lenses. A key point to keep in mind is that the higher your magnification is, the narrower the field of view is. When light enters the scope and reflects off of the metal, it reduces the image quality of the target. This is why you want to find a scope that has interior coating, to prevent reflection off of the metal,. Eye relief is simply the distance between your shooting eye and your eyepiece lens. If your eye relief is too small, there is a risk of hitting your eye with the eyepiece when your crossbow releases an arrow. A general rule of thumb is: higher magnification and field-of-view equals shorter eye relief. This is a measure of the amount of light that reaches your shooting eye. Length is straightforward. It measures your crossbow scope, from the leading edge of the objective lens to the back edge of the eyepiece. Longer models tend to have greater magnification. However, some shooters prefer shorter scopes for their weight and smaller profiles. Your scope’s center tube diameter affects its durability. It also determines what size rings and base you need for mounting, as well.